If you've ever been stranded in time with an unknit gift on the brink of a gift-giving occasion (or think it might happen some day) today's story is for you. 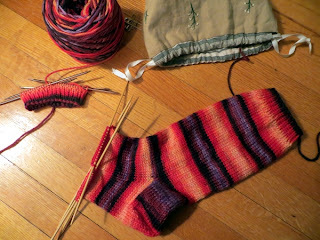 It's about the sleep socks I've been working on over the holiday, for my cousin. This year, for a lot of long-winded and boring reasons, I blew it completely. So I came up with another idea: I cast these socks on just before Christmas when all the other knits were done, and starting very late on Christmas Eve so she'd open the first one on the Day, I've been sending her update photographs. What I'm going for is a kind of treasure hunt until I can put them in the mail - express mail, naturally. I might be running late, but I'd still like for her to get them before spring. That first photo was taken after a long pre-church service knitfest on Christmas Eve. 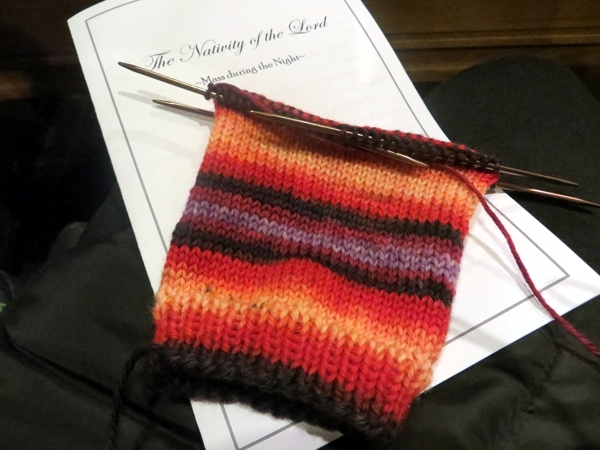 It's crowded in churches at Christmas, so you have to show up early and wait in a cosy pew - never a problem for a knitter. 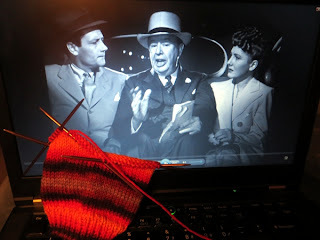 A few days later there was a long drive for another outing with family, and I got in some bonus knitting thanks to a construction-related traffic jam. Yay traffic! I think there was some movie knitting involved in producing this shot, too. Wondering about the yarn? It's two skeins of Duchess from Twisted Fiber Art, which I bought from another knitter who bought it years ago and recently destashed it to me. The colourway is Guardian, one I haven't seen in probably ever, so probably it isn't being dyed any more. Pretty though! And later still, after a rare episode of sofa knitting - 'rare' because the cable was out for most of the holiday and without cable, why bother carrying everything to the TV? 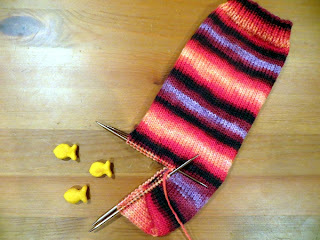 I can never resist the chompy sock experience when I photograph one at this early point in the gusset. 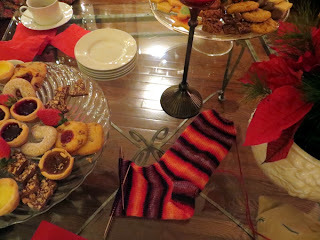 On New Year's Day the second sock came to a party with even more enticing snacks than Goldfish, but they were safe because the chompy sock had been Subdued. I had hoped to have these done by the end of the holiday, and I'm pretty close to finishing them today (if I ignore a lot of other less interesting but more urgent things). They've been fun to make, and even more fun to photograph. I think showing her how I more or less brought her along with me to festivities and movie dates makes the socks that much more special, don't you? In addition to being special, these things are fast. DK socks are a lifesaver! and speaking of DK, I have some news on that front to share another day soon. Really happy news, yay. Have a wonderful weekend with some crafty success in it yourself, and I'll see you Monday. I don't like to see blog posts without comments. 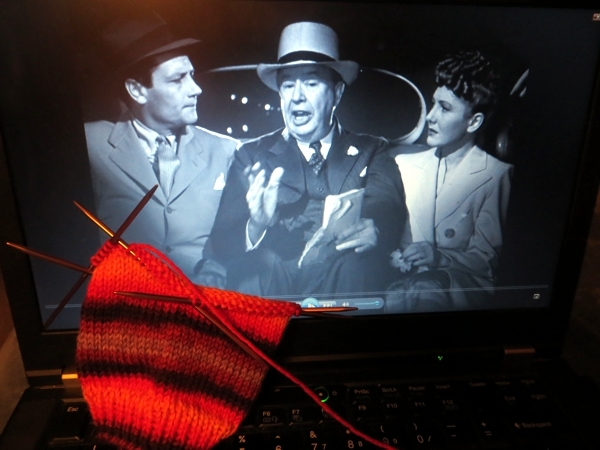 I thank all the bloggers out there who regularly post so I can indulge myself vicariously in their knitting world. Aw, thanks Joan - happy new year to you too! Thanks Mary. The choppy sock really makes me laugh. And your late gift idea is clever!